On August 24, 2006 scientists decided they hated all former schoolchildren by declaring that Pluto was no longer a planet. 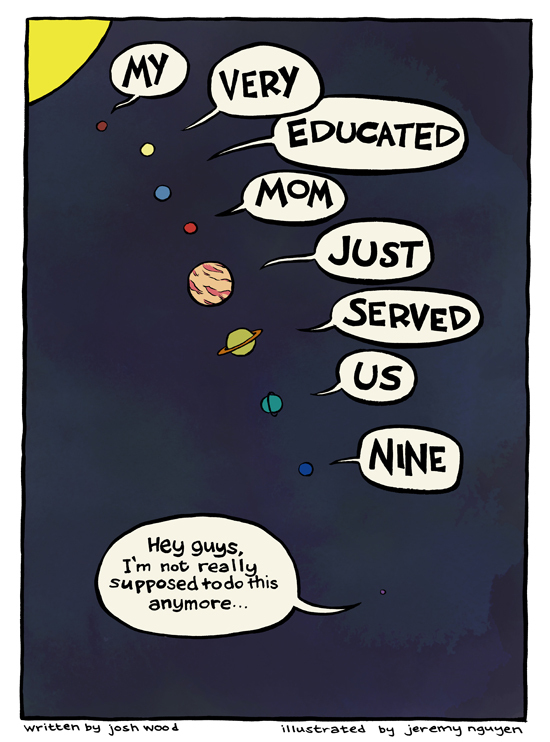 I immediately thought how weird it must have been for 3rd grade students who had just learned on August 23rd that not only Pluto was a planet, but they were also taught a cute mnemonic device to remember it that was now obsolete. “Hey class, I know we just learned My Very Educated Mother Just Served Us Nine Pizzas, but now remember Many Very Educated Men Justify Stealing Universal Mnemonics” (3rd graders don’t know that mnemonics starts with an “M”). 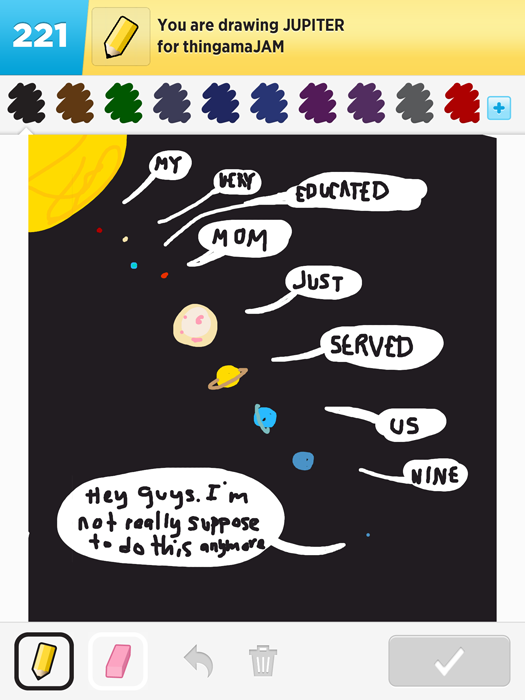 I love playing Zynga’s Draw Something (originally OMGPOP) on my iPad and I often draw little comics for my opponents. I sent this one to my friend, Jeremy, and he loved it so much that he redrew my comic. I feature his below, but I also decided to include my original (which Jeremy oddly thinks is better). This entry was posted in Uncategorized and tagged Draw Something, Jeremy Nguyen, mnemonic, My very educated mother, OMGPOP, Zynga. Bookmark the permalink.